Central and South America produce far more coffee than any other growing region. Coffees from Latin America are celebrated for their great balance, medium body and clean finish. In some of these coffees, the acidity sparkles clearly above the other flavor components; in others, it provides a subtle but crisp accent. A tangy brightness and consistent quality also make them ideal foundations for blending. Brazil Bourbon Santos – Fruity coffee, Bourbon refers to a variety of Coffee Arabica, which first appeared on the island of the same name (now Reunion Island). Santos refers to the port that the coffee shipped from — historically the main point of export for coffee. Capulin – Smooth, low acid coffee, subtle but complex flavor, unwashed, sun-dried, hand sorted. Nayarit Province of Mexico. Coatepec, Altura Coatepec – Region in Mexico producing high-grown coffee. Colombian – General term for coffee from Colombia. Common names of producing regions are Medellin, Armenia and Manizales. Costa Rica Central Valley – Region in Costa Rica on the slopes of the Poas, Barva and Irazu volcanoes with altitudes of 4,500 to 5,000 ft. Coffee is known for excellent body and finesse. Costa Rica Orosi – City in Costa Rica with surrounding area producing perfect balance between body and acidity in coffee. Costa Rica Tarrazu – Bright, crisp acidity and intense flavor, good body and exceptional aroma. Region in Costa Rica producing high-quality coffee. “The Land of the Saints” is in western Costa Rica, and has altitudes reaching 6,000 ft.
Costa Rica Tres Rios – Lively, tangy and fragrant, smooth and well balanced. Region in Costa Rica producing high quality coffee on the eastern outskirts of San Jose. Costa Rica West Valley – Region in Costa Rica with altitudes at 3,000 to 3,500 ft. Naranjo, Palmares and San Ramon are coffee-producing communities at these altitudes, producing coffee with good aroma and balanced cup. El Salvador – Mild, slightly acidic coffee, good component to blends. Guatemala Antigua – Region in Guatemala stated to be the birthplace for all coffee in Guatemala, with majestic volcanoes: Fuego, Agua and Acatenengo. Guatemala Atitlan – Region in Guatemala framed by three volcanoes: Toliman, Atitlan and San Pedro, and containing lake Atitlan. Small plantations in this region often use avocado trees to shade the coffee plants. Guatemala Coban – Region in Guatemala containing rugged limestone mountains that have rainfall all year. Guatemala Fraijanes – Located south of Guatemala City, this region is so high in altitude, and it is not always considered a plateau, with soil frequently nourished by Guatemala’s most active volcano, Pacaya. Guatemala Huehuetenango – Region in Guatemala located northwest of Guatemala City. Surrounded by mountains and many rivers, which nourish its soil. 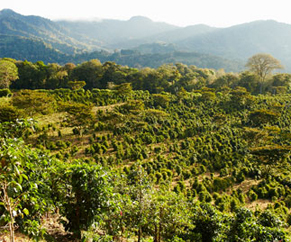 Guatemala Oriente – Easternmost gourmet coffee region in Guatemala with the newest plantations. Guatemala San Marcos – Region west of Guatemala City, has the country’s two highest volcanoes, Tacana and Tajumulco, the latter being the highest in Central America at 13,800 ft.
Jamaican Blue Mountain, Mavis Bank – Coffee similar in quality to Wallensford Estate. Jamaican Blue Mountain, Wallensford Estate – Extremely smooth, vibrant acidity. Believed by some to be the best overall coffee available. La Minita Estate – Tarrazu District, Costa Rica, full bodied coffee with medium acidity. High quality. MAMS – Blend or quality of coffee from Colombia from the following regions: Medillin, Armenia, Manazalles, Seville. MAM – Blend or quality of coffee from Colombia from the following regions: Medillin, Armenia, Manazalles. Mexico Altura – High grown coffee from Mexico, light with snappy, nutty flavor. Mexico Coatepec – Region in Mexico. Mexico Chiapas - Region in Mexico where coffee is produced; best coffee is from closest to the Guatemala border. Narino Supremo – Highest quality and largest bean from Colombia. Nicaragua – Medium body coffee, medium to high acidity. Oaxaca, Oaxaca Pluma – State in Mexico. Believed to be one of Mexico’s best coffees. Yauco Selecto – Believed to be highest quality estate coffee from Puerto Rico. From the mountainous eastern half of the African continent and the Arabian Peninsula come some of the world's greatest coffees. Arabian coffees produce coffees that often have sweet flavors reminiscent of the aroma of a bowl of fresh fruit. This quality is balanced in some of these coffees by a somewhat tart acidity. This region exhibits a wide range of flavors, from mellow and winy to zesty and citrus. Bugishu – from the slopes of Mt. Elgon in Uganda, rated as one of Uganda’s best. Also said to be inconsistent. Ethiopia Djimmah – Region in Ethiopia producing natural coffee, usually used in blends. Ethiopia Harrar – Region and city in Ethiopia. Legendary for mocha flavor, very distinctive unwashed character. Ethiopia Ghimbi (Lekempti) – Natural coffee from Wellega region. Light to medium acidity, clean cup with fruity character. Ethiopia Sidamo – Region in Ethiopia, fairly balanced cup regarding acidity and body. Both washed and natural. Ethiopia Yirgacheffe – Premium quality from highest elevation in Sidamo region. Washed, clean cup with lemon-like acidity. Ethiopia Limmu – Name given to washed coffee from Djimmah. Exhibits winey characteristics. Ethiopia Tepi – Lowland plantation-grown washed coffee from Kaffa region. Government owned plantation. Ethiopia Bebeka – Lowland plantation-grown washed coffee. Government owned plantation. Kenya AA – Rich and sweet with a hint of black currant. “AA” refers to grade and size of the beans. Tanzania – Clean flavored coffee, brisk acidity. Yemen Mattari – Region in Yemen producing high quality coffee. Yemen Mocha – Full bodied, medium acidity, also known as Arabian mocha, Yemen or Mocha. The name mocha comes from the ancient port, presumably from where this coffee was often shipped. Yemen Sanani – Low acid Yemen coffee, medium body, said to be one of the best from Yemen. Yemen Sharki – Region in Yemen. A large percentage of these coffees come from Pacific Islands like Indonesia and are typically lively with herbal undertones. Asia’s coffees are popular for their full body and mellow, earthy flavors. The coffee's country of origin is largely a matter of subjective taste. Origin is important in that the comparative bean flavor between growing regions, even within the same country, can be quite different. Celebes – Rich flavor, light body, low acid. Also referred to as Sulawesi.